Bridge Centre | Maciver Consultancy Services Ltd. 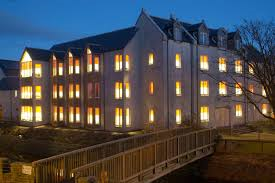 The Bridge Centre project involved the construction of a multi use facility, which included residential accommodation for students at the Lews Castle College, a youth club and accommodation for Student Nurses as well as the Community Foyer Project. The Architect on the project was Stuart Bagshaw and the Quanity Surveyor was The Rennie Partnership. Maciver Consultancy Services Ltd provided Civil and Structural Engineering Services. Local contractor John Murray & Co successfully completed the work. The structural engineering aspect of the project included the design of a steel frame and composite concrete decking for the Youth Club section of the building. MCS carried out a SER Certification Scheme design check. In addition the building footprint was situated on an abandoned landfill site. A vibro-compaction solution was adopted for obtaining the required bearing pressures while avoiding the removal of contaminated soil.